I’ve been a Mets fan since 2006. I know that doesn’t seem like much, but I’m only 15. It’s fair to say that a good portion of my day is consumed by the New York Mets. My entire evening is, six to seven days a week, and I spend a good amount of time reading my favorite Mets blogs out there, like Just Mets, Mets Merized, Mets Blog ESPN, Amazin Avenue, MetsBlog.com, and plenty others. And, of course, I have MetsPlus, which I devote a fair amount of time in to every day. Buy and large, the Mets are my team, and I’ve wholeheartedly invited them into a huge portion of my life. Since I’ve been a Mets fan, we’ve never been satisfied with a manager. Willie Randolph? People liked him in 2006, but the collapse of 2007 doomed him, I was surprised he was allowed back in 2008. Jerry Manuel was smart, but once the Mets moved into Citi, and the pieces didn’t come together, he too was doomed. 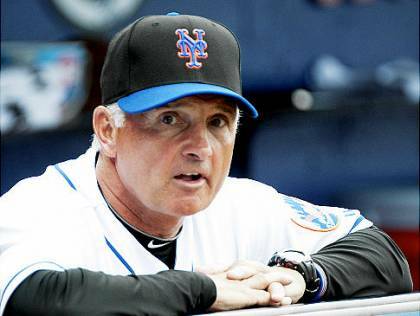 Then came Terry Collins, the man who has received more criticism then any Mets manager in a long time, and, come to think of it, a lot of it is justified. My wise friend Shannon from MetsPolice.com wrote this amazing article before the Mets May collapse, talking about how the Wilpons got a “taste” of winning, and that the 11 game win streak could ultimately lead to Collins demise, and it could make them more anxious to pull the trigger on a blockbuster trade. I have to agree with Shannon on both of those fronts, for the former, I agree with him because I personally believe that Collins can be held accountable for the Mets slump as of late. Lets take a look at the Mets lineups. Ruben Tejada has somehow made his way into five of the last seven games starting lineups, despite batting an abysmal 205. Why is that? Why was Juan Lagares not batting leadoff, like he was all of Spring Training? If the Mets hadn’t had such a successful April, I believe there would be a much bigger debate on that. John Mayberry Jr and Kirk Nieuwenhuis have seven combined hits, double that number for one hitter and you still have an unsuccessful bench player. The Mets have a lot of problems. And we are only half way through the list. Why is Curtis Granderson looking to walk in situations that call for a big hit? A 235 batting average is completely unacceptable for a man that has only hit three home runs and is payed $16 million dollars to do so. Why is it that Wilmer Flores makes an error in almost every game? Since MLB is the world’s biggest stage, you are telling me that Wilmer Flores is in the world’s list of 25 greatest shortstops? No, he isn’t, not even close. Why has Daniel Murphy, Citi Field’s most consistent hitter, been bounced around in the lineup, and why was he benched on Thursday to accommodate Tejada, when the Mets had two days off the week prior? Where is Michael Cuddyer? Was he really getting a boost from Colorado, and is he ever going to hit above 250 again? When the Mets pitchers begin to slump, who is going to take charge? How many times are the Mets going to postpone David Wright’s date of resuming the slightest baseball activity? And finally, and most importantly why is it that Las Vegas, managed by acclaimed manager Wally Backman, maintains a league best 24-12 record, despite it’s roster being bounced around and being decimated to accommodate the MLB roster. Why is it that a lot of players happen to preform well under Wally Backman, but struggle under Collins? Well, one answer is that it’s the difference of AAA to MLB, but I think it’s something more, remember D’Arnaud last year? His problem was fixed the moment he went down to AAA. Are the #FireTerry guys right, and should we bring Backman here ASAP? Well, let me truly scare Mets fans. Let’s say Backman comes up tomorrow after Collins screws up tonight’s game. Then, hypothetically, let’s say the Mets continue to slide after Backman is recruited. That will send Mets fans into total panic mode. But that could happen if Collins gets fired. The answer is simple. The Mets need to stop being stand-patters and become buyers, now. And when I say now, I mean before the Cardinals leave New York, and preferably before. The Mets have first place now, and they might not before the end of today, May 16th. We might be looking at a 15 month wait if the Mets don’t take urgent action. The blame does have to fall on the coach, but you also need good players. Operation Flores was a fail, and Cuddyer and Granderson have been as well. If I was the GM, I would get a big name in here, as well as Wally Backman. The Time is now for the New York Mets, they are blessed with great pitching, and it is a disgrace that they don’t back it up with proper hitting. I’ve never been so upset with this franchise, but I hope you believe that my reasons are justified. You are very astute for a 15 year old! Read my profile Twitter @DyingMetsFan and you will see that I agree with you about a new manager. Your article was well thought out and written. Why have you no called out Sandy Alderson? He is the worst General manager the Nets have ever had. Home grown talent, yes? One stinking free agent per year? Not enough. The time is now, Sandy…you jackass. Loosely the purse strings and spend some money on a bona fide hitting star that can generate some excitement and carry a team offensively for a couple of weeks at a time. You would be amazed To see how great the David Wright’s are when they have big hitters around them. Duda? Please. Nice Pop but not a superstar by any stretch. Cuddyer? Nice hotter but can’t carry a team either. Neither can Grandy. But you put a big bat Like Tulo in the lineup and everyone will get better around him. So there it is. Maybe I should be GM cause Sandy is a puppet for a cheap bunch of owners that are too busy molesting employees and screwing around with bad investment dirtbags. I agree with you. I criticize Sandy routinely for being a stand-patter. He never pulls the trigger on anything, and it is a big problem, and it will be an even bigger one going forward.